Manjushrimitra was born into a brahmin family in the city of Dvikrama, to the west of Bodhgaya in India and became a great scholar. In a vision Manjushri instructed him to travel to the Sitavana charnel ground in India if he wished to reach enlightenment during his lifetime. There he met Prahevajra and studied the Dharma with him for seventy-five years. When Prahevajra attained nirvana, Manjushrimitra beheld him in the sky in a mass of light. With the sound of a thunderclap a tiny golden casket descended from the light into the palm of his hand. Within it Manjushrimitra found Tsiksum Nedek (The Three Lines That Penetrate the Essence), written in blue malachite on a leaf. Just by seeing it he attained realisation equal to that of his teacher. 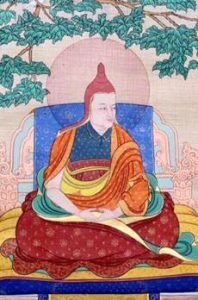 He classified the 6,400,000 verses of the Dzogchen teachings into the three sections of Semde (Mind), Longde (Expanse) and Me-ngagde (Instructions). He recorded the oral transmissions he had received and concealed them in a boulder marked with a crossed dorje. He meditated for many more years at Sosadvipa, a charnel ground west of Bodhgaya and transmitted the Dzogchen teachings to Shri Simha. At the end of his life he dissolved into a rainbow body, amidst wondrous displays of lights and music filling the sky.